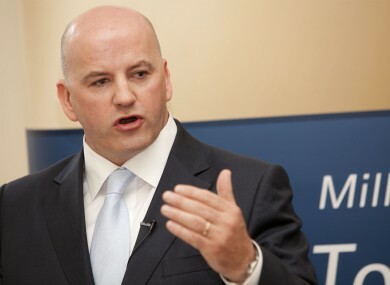 Presidential hopeful Sean Gallagher denies accusations that he is covering up his past links to the Fianna Fáil party. PRESIDENTIAL CANDIDATE Sean Gallagher has denied accusations that he is trying to play down his links to the Fianna Fáil party – saying he has “never, ever been secretive” of his past history with the party. On an interview with RTÉ’s Today with Pat Kenny this morning, Gallagher acknowledged that he had previously been a member of the party and had addressed party events in the past, but insisted he was not running as a de facto Fianna Fáil candidate in October’s election. “I have never, ever been secretive [of my link to Fianna Fáil] – in fact, I’m proud of it,” Gallagher asserted in response to a listener’s question. The Dragons’ Den investor said he did not have any connection with the party between 1993 – when he finished working as a political secretary for then-Health minister and Cavan-Monaghan TD Rory O’Hanlon – and 2007 when he acted as a campaign manager for Louth’s Seamus Kirk. Subsequent to this Gallagher was appointed to the party’s national executive, but the Cavan native said he was no longer a member. Though he had addressed Fianna Fáil meetings and conferences since then, he said he had also been spoken “at community groups and chambers of commerce” to try and spread his message of positivity about Ireland. In seeking nominations to contest the presidential election he said he had also been supported by councillors from Sinn Féin and Fine Gael. Other listeners asserted that Gallagher had actively worked for Fianna Fáil as recently as last winter, when he canvassed for Brian Ó Domhnaill in the by-election in Donegal South-West. While he today acknowledged that he had considered running He was also reported to have been considering running for Fianna Fáil in the general election, but today explained that he had opted out of running in the general election because his message was “universal” to all of Ireland. Gallagher is already assured of appearing on the ballot paper for the election, having secured the nomination of six county councils so far. Would you consider Seán Gallagher as a de facto FF candidate if the party does not run one itself? Email “Gallagher has "never ever been secretive" of Fianna Fáil links”. Feedback on “Gallagher has "never ever been secretive" of Fianna Fáil links”.